Nearly four-in-ten Democrats (39%) name Russia as the country that represents the greatest danger to the United States – the highest percentage expressing this view in nearly three decades, according to a new survey. Compared with 2013, the last time this question was asked, greater shares in both parties volunteer Russia as posing the greatest danger to the U.S. – but nearly twice as many Democrats as Republicans now say this (39% vs. 21%). The new Pew Research Center survey of 1,501 adults was conducted April 5-11, before the recent rise in tensions with North Korea, its failed missile test and Vice President Mike Pence’s visit to South Korea. Overall, 31% of Americans, answering an open-ended question, cite Russia as the country representing the greatest danger to the U.S., while 22% point to North Korea. The shares naming both countries are among their highest dating back to 1990. Fewer cite China (13%), Iran (9%), Syria (6%) and Iraq (5%) as countries representing the greatest danger to the U.S. The new survey is the latest indication of growing concern among Democrats, in particular, about Russia in the wake of reports that the Russian government interfered in the 2016 U.S. election. A January survey found that Democrats were far more likely than Republicans to say that Russia was behind the hacks of the Hillary Clinton campaign and the Democratic National Committee. That survey also found that 38% of Democrats viewed Russia as an “adversary,” compared with 20% of Republicans. The new survey finds that Russia is by far the top national threat in the view of Democrats and Democratic-leaning independents: 39% name Russia, while 21% cite North Korea and 13% point to China. Opinion is more divided among Republicans and Republican leaners. About a quarter (27%) say North Korea poses the greatest danger to the U.S., and another two-in-ten each cite Russia (21%) and Iran (18%). 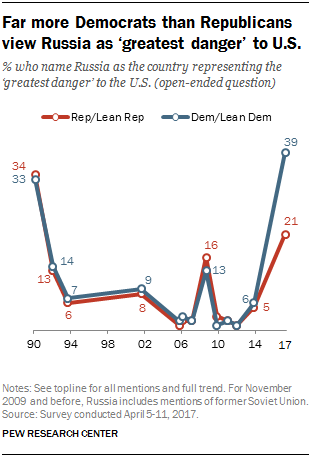 The current partisan divide in mentions of Russia as the “greatest danger” is as large a partisan gap as for any country dating back to 1990, when Pew Research Center first asked this question. It also is the first time that a significantly larger share of Democrats than Republicans has named one single country as representing the greatest U.S. threat. Historically, the pattern has been reversed, with greater proportions of Republicans than Democrats naming one particular country as our greatest threat. The share of Americans citing Russia as the country representing the greatest danger to the U.S. has fluctuated a great deal over the past three decades. In March 199o, 32% of the public said Russia was the greatest danger, but just two years later, that figure fell to 13%. The share citing Russia as the greatest danger has remained at a fairly low level until this year, except during the conflict between Russia and Georgia in the summer of 2008. Throughout this period, there has not been a significant partisan difference in mentions of Russia as the greatest U.S. danger until now. Note: The full topline and trend data can be found here (PDF).